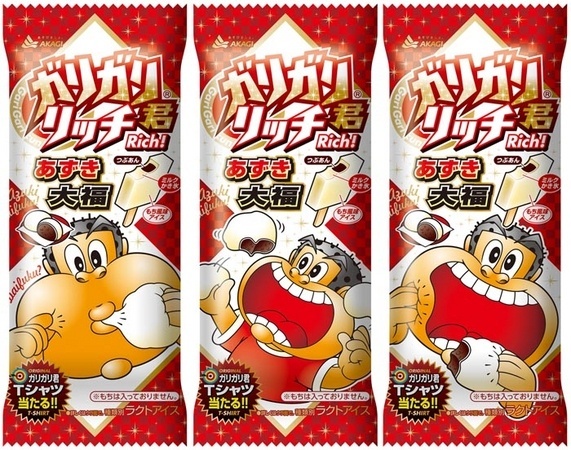 Garigaikun is one of the most popular ice cream from Akagi Nyugyo co., Ltd.
Garigarikun Soda is the well-known flavor since 1981 and they launch several flavors every year. This winter, they launched Azuki Daifuku flavor on December 18, 2012. Azuki is sweet red beans and Daifuku is a rice cake stuffed with azuki, which is a Japanese famous sweets to enjoy with green tea. As it's a "Rich!" line, it's more expensive than regular Garigarikun Soda flavor (50JPY) and I think I bought this Azuki Daifuku for 80 JPY or so. According to their official HP, they used domestic sticky rice flour to create mochi (sticky rice cake) flavored ice cream candy. Inside of the ice cream bar, there're shaved ice with milk made with heavy cream and also sweet red beans made in Hokkaido. The flavor and texture with Garigarikun's famous ice chunks can make you feel like eating heavy cream Daifuku. I found there're 3 packages. I was thinking which one to get (even though the inside is the same) and chose the one below. One square ice cream was in the package. First I thought it'd be hard to bite off but actually it was kind of crispy since inside of the ice cream was shaved ice and sweet red beans. The brown stuff in the middle is sweet red beans. It's "Tsubu-an" which is not fully or finely ground beans and has skins. --- Some can't stand with "Tsubu-an" so I needed to mention it's not fully mashed beans. On the front, it says they don't use actual mochi (sticky rice) but apparently the very outside white part is mochi flavored ice cream (made with sticky rice flour), and another white part around the sweet red beans is the shaved ice with milk flavor. The more I ate, the more I could sense the mochi flavor somehow. Not sticky at all but the fragrance after biting and melting away on my tongue, I could smell the familiar flavor of Daifuku.